Featuring a stellar blend of veterans, who have won a combined 13 Olympic and 10 World Cup gold medals, and some of the top, young talent in the nation, 16 finalists have been selected for the 2018 USA Basketball Women’s World Cup Team. The athletes were selected by the USA Basketball Women’s National Team Player Selection Committee, which is chaired by USA Women’s National Team director Carol Callan. Headlined by four-time Olympic gold medalists Sue Bird (Seattle Storm) and Diana Taurasi (Phoenix Mercury), who have claimed five World Cup gold medals between them, and two-time Olympic and two-time World Cup gold medalist Tina Charles (New York Liberty); the list of finalists also includes 2016 Olympic gold medalists Elena Delle Donne (Washington Mystics), Brittney Griner (Phoenix Mercury) and Breanna Stewart (Seattle Storm); as well as 2014 World Cup gold medalist Nneka Ogwumike (Los Angeles Sparks). Hoping to earn a spot on their first USA World Cup Team are Layshia Clarendon (Connecticut Sun), Napheesa Collier (University of Connecticut), Jewell Loyd (Seattle Storm), Kelsey Mitchell (Indiana Fever), Tiffany Mitchell (Indiana Fever), Kelsey Plum (Las Vegas Aces), Morgan Tuck (Connecticut Sun), Elizabeth Williams (Atlanta Dream) and A’ja Wilson (Las Vegas Aces). “We had a great group of pool players that gave themselves a chance to be a part of the 16, but unfortunately the committee has to get that number down,” said USA and University of South Carolina head coach Dawn Staley. “The committee has to form a team that can compete at the highest level, and the unit that they selected should help us accomplish that. I’m just looking forward to leaving the country and playing some different competition, and continuing to create a bond and build the chemistry that is needed to win the World Cup. Griner and Taurasi will join the USA squad in time for the French tournament. Bird, Delle Donne, Loyd and Stewart advanced their teams to the WNBA Finals, and are expected to join the finalists at a later date. 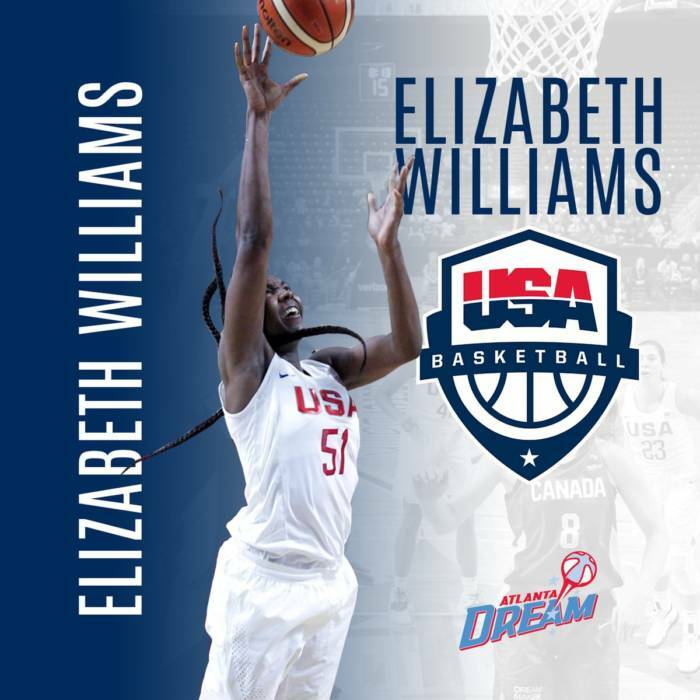 The USA began training on Sept. 3 in Columbia, South Carolina, with 18 athletes, and Williams joined the team in New York after the Dream was eliminated from the playoffs. After an intrasquad game on Sept. 5 in Columbia, the team earned two exhibition victories over Canada (74-68) on Sept. 8 in Bridgeport, Connecticut, and Japan (102-87) on Sept. 10 in Washington, D.C. Assisting Staley through the World Cup are Dan Hughes (Seattle Storm), who will join the team upon the conclusion of the WNBA Finals, Cheryl Reeve (Minnesota Lynx) and Jennifer Rizzotti (George Washington). Follow @eldorado2452 on Twitter and Instagram for all your Atlanta Dream, WNBA and sports news.